Where Scribes Bookshop is now, on the corner of Great King and St David Streets in Dunedin, there was once a notorious flat, called the Shambles. It was well known for it’s parties and as a location to go to continue drinking once the pubs had closed. It’s not entirely clear from where the name of the flat originated: it may have been the shambolic nature of the place itself, or it may, as has been suggested by a former resident, been named for a place in Manchester of the same name. Shambles is an old name and derives from Viking word Shamel apparently meaning ‘bench’, ‘booth’ or ‘shelf’ and the name is found in many places in the UK where there are market places. The most famous example such a place is the Shambles in York which is allegedly mentioned in the Doomsday Book, one of the few streets that is. This would make it over 900 years old. This is a quintessential medieval street with upper storeys of buildings stretching out across the street precariously towards each other. The street was once a flesh market (hence also being known as Flesshamel) – that is, a street of butchers. Livestock were slaughtered in the streets and it’s been suggested that it is this resulting mess that provides the word shambles with its contemporary definition. In fact the OED gives three definitions: 1) a mess or muddle, 2) a butcher’s slaughterhouse, 3) a scene of carnage. 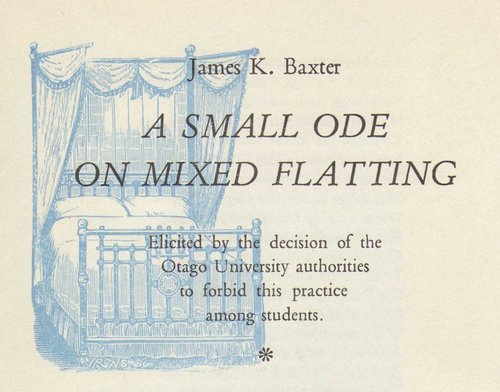 Reports about the Shambles in Dunedin, of parties and exploding pans of golden dough boys from the 1950s and 60s, suggest the OEDs third definition may be most approprite for explaining the name of our Great King Street residence. Abbey College, hall of residence, was once Abbey Lodge, it’s a crazy rough cast Spanish styled motel. It doesn’t complement the Victorian and Edwardian architecture of the area. Once upon a time in the 1970s there was a flat on Castle St, opposite Abbey College called Nightmare Abbey – did the name of the flat influence the name of the hotel???? Jim Mora, broadcaster and resident of Nightmare Abbey is convinced it did. Last night I read a short reminiscence by an alumnus of Otago’s mining school about his flat called The Shambles on the corner of St David and Great King Streets. He lived there during the early to mid 1960s. There were some very amusing recollections, including one about a large orange fungus growing in the bathroom.